"Founded in January of 2005, the Younger Women’s Task Force, a project of the National Council of Women’s Organizations, is a nationwide, diverse, and inclusive grassroots movement dedicated to organizing younger women and their allies to take action on issues that matter most to them. By and for younger women, YWTF works both within and beyond the women’s movement, engaging all who are invested in advancing the rights of younger women." I walked into the lavatory (I haven’t used that word since elementary school!) and witnessed four girls applying make-up on another girl: different color eye shadows, blush, and lipstick…the makings of a hideous clown. The girls kept eyeing one another, giggling, and saying, “You look really beautiful. The boys will love you.” The clown-faced girl was beaming from ear to ear. I didn’t understand how she didn’t know that these girls were ridiculing her. I also didn’t understand why the so-called aggressors would want to do such a thing. So, whatever happens to the mean school girls? Well…they typically grow up to be mean women. Women are territorial with teeth, passionately protective, fiercely jealous and deeply mistrustful due to strong instinctual drives. Women like wolves, attack in packs, rarely ever confronting without some back up from their peers. Knowing the full value in the power of numbers they encircle their victim and take little chunks from all sides, whittling away at the self-esteem of the victim, and their desire to be included, a drive most women so feverishly have. Some women are extremely adept at "silent aggression" and derive the most perverse pleasure watching their object of ridicule squirm, cry, and otherwise become unhinged. The more signs of weakness from the victim, the more vicious the attack, making the alternatives for the "odd girl out" less and less apparent. What I have found is that these individuals…bullies…are easier to deal with when you understand them. According to Professional Life Coach Heidi Costas, despite the façade that such people put up, bullies have low self-confidence and low self-esteem, and thus feel insecure. 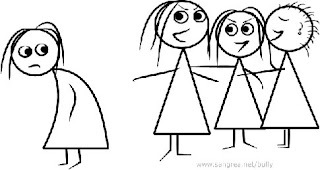 Low self-esteem is a factor highlighted by all studies of bullying. Bullies are seething with resentment, bitterness, hatred and anger, and often have wide-ranging prejudices as a vehicle for dumping their anger onto others. Bullies are driven by jealousy and envy. 1. Maintain my confidence. I refuse to let anyone intimidate me. 3. Do not pledge allegiance to backstabbing cliques or groups. 4. Aim to embrace a spirit of cooperation in my interactions with others. And I must say, in most instances, I have been successful…yet the fight to end relational aggression continues! Interested in hearing other strategies for dealing with relational aggression (female bullying)? Check out Cheryl Dellasega’s book, Mean Girls Growing Up: Adult Women Who Are Still Queen Bees, Middle Bees, and Afraid-to-Bees. She explores why women are often their own worst enemies, offering practical advice for a variety of situations. Drawing upon extensive research and interviews, she shares real-life stories from women as well as the knowledge of experts who have helped women overcome the negative effects of aggression. Readers will hear how adult women can be just as vicious as their younger counterparts, learn strategies for dealing with adult bullies, how to avoid being involved in relational aggression, and more. And since research has shown that girls between the ages of 8 and 17 need a little extra protection against the emotional and social hazards of growing up…Rachel Simmons, in her books, Odd Girl Out: The Hidden Culture of Girls and Odd Girl Speaks Out: Girls Write about Bullies, Cliques, Popularity, and Jealousy, prescribes clear-cut strategies for parents, teachers, and girls to resist bullies and their acts of aggression. She also has great resources on her website. I am so happy you're going to be a regular poster. You go, Erika! Glad to have found this information. I've heard of the Queen Bee book, but not the Odd Girl Out, and I can't wait to read Rachel Simmons' books. My wish is that women wouldn't have to fall into these traps of being bullies, victims or bystanders. Women need women as friends, not enemies. Maybe this will change someday. I couldn't agree with you more! And you are not alone. I think with each woman doing her part, things will change...slowly. In the meantime, I truly cherish and nurture the positive relationships that I have with females. Great post! I googled this topic and found your article. I'm in nursing school and dread going back to school due to vicious women there. It's truly sad that those who are supposedly "helping us" are actually looking for opportunities to make themselves feel better by actively making others feel terrible. These are pointers I will use for the coming year. Hopefully, one day, these women will be put in their place. Seeing how some of them are, I would NEVER want them to look at my medical record! But perhaps over time, they will stop their actions. Thanks for the read and the comment! And definitely, I've learned to pick my battles but sometimes you just have to confront the bullies and their antics before they cease and desist their behaviors! Good luck in nursing school! This is good that this subject is being dealt with publicly and openly. For many years due to femininism this subject was made taboo. Definitely! It's all about raising awareness and engaging in positive dialogue about the subject. Thanks for the read and comment, Janice. Thanks for the read and comment. I was able to relate to your story and I'm sorry to hear that you had to leave your workplace because it was so bad. When it got that bad for me at the workplace, I was most thankful for the positive female relationships that I had and leaned on them for support/advice. This was a really useful article. At the moment I am experiencing bullying in a group of friends. The bully took great delight in undermining me, sarcatic comments,and full blown offensive comments, towards my husband,my children and myself. At the time it was carried out with a smile and my other friends all thought it was pretty harmless. This bully approached me on one occasin,and attempted to threaten me into excluding one of the other friends in our group from all further get togethers etc. I refused to do this and almost immediately things got a lot worse. She indicated that she no longer liked me and we didn't get on, so I couldn't hangout with my friends anymore. To my suprise my friends went along with this as shehad told themI was being difficult and had "fallen " out with her.Thishasbeen goingon for 2 years now and the other friends in the group have gradually been manipulated and rarely see me anymore. It is extremely stressful to be subjected to all this and it has taken a toll on my health. I am amazed that grown women can be manipulated so easily and believe lies. I have a therapy background andhave worked in famiy psychiatry for the last 10 years. My qualifications were like a red rag to a bull with this girl- she despised my expereince and belittled me at every opportunity !! I think my experiemce demonstrates that although youmightthink you have life expereince to deal with this kind of abuse, when it happens, sometimes you are completely unprepared to take it on alone. Wow, I am sorry to say that your story is all too familiar to me. Sometimes, when people, not just women, get jealous or are insecure, they will act out like that woman you described in your post. It somehow makes them feel better about themselves. This is probably easier said than done (and it took me probably a good year or two to do this), but you will save yourself a lot of headaches and stress if you leave her and the entire group alone. What a shame that she was able to manipulate your friends. But, if they're on her side now, just leave them all alone and work on fostering positive relationships with other females. There are some out there. It may be lonely at first, but remember, you have your husband and children. It can be difficult at work, but if you keep yourself busy (even during breaks and at lunch time - leave the building during those times, if possible, consider sitting in your car and reading if you have to) the day will go by faster. Eventually, they will leave you alone and sadly, will find another person to harass. I sincerely hopes your situation gets better sooner than later. Great article and very on point. I was ousted out of a 'group' several years ago by none other than my best friend at the time and this wasn't in Middle School but rather after college when I was 25 and I thought women had gotten pass the whole 'mean girl' games, but I was wrong. I had started dating a very handsome and well-off gentleman (who is now my husband) and my BFF demanded I break it off with him and when I didn't I was unceremoniously dumped by my BFF who led the lame group that in turn turned on me like retarded followers with no brains will. Even her parents joined in on the bullying! Very sad to think that a couple of 50+ year olds can act just as bad as a 14 year old girl! The meanest, most jealous women I've ever met are normally older women (40's & 50's). I wonder why that is?